At Hardscape Solutions, we're passionate about designing and building outdoor spaces that supplement your lifestyle. Quality Customer Service, Expert Craftsmanship and Timeless Designs. Our Portfolio Speaks to the Caliber of Our Work. With satisfied clients that include the Lansing Capitol, the Plymouth Library, multiple Hampton Inns and more, the attention to detail that we put in our work goes unmatched. 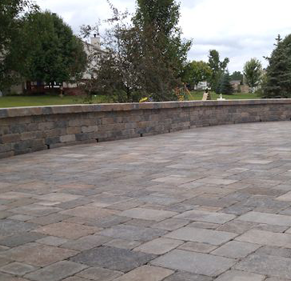 Trust Hardscape Solutions to create a stunning outdoor environment for your family and friends. When you choose us as your brick paving contractors, you can rest assured that you’re choosing the best in the industry. We have over 75 years of combined experience in landscape design and construction that ensures only the highest quality of workmanship. Our team is friendly, knowledgeable and always has your home’s best interest in mind! Hardscape Solutions has worked hard to earn our customers’ confidence and trust, and we will continue to work even harder to keep it. One of our greatest assets is our ability to pay attention to all the details, and this alone makes us stand out from our competitors. The most important aspect of any successful project is planning. Our highly skilled professional designers will walk you through your project’s process from start to finish. We will provide you with a master plan (a professional architectural-scaled drawing of your entire project), which will give you an idea what the finished product will look like. In addition, we can perform an accurate material take off, allowing us to submit a realistic budget that you can have confidence in. Our designers have various backgrounds, including landscape architecture, horticulture, construction, estimating and management. However, their greatest ability is to successfully coordinate high-quality results! We have hundreds of satisfied clients; let us make you a believer, too. If you’re ready to talk about your next outdoor project, contact Hardscape Solutions today to schedule your free consultation!